Baby carriers are more ergonomically friendly than ever, a trend that's reflected in our new top pick and runner-up, the Ergobaby Four Position 360 and the Tula Ergonomic. These popular carriers keep parents comfortable during long periods of use and won't leave babies' legs dangling, a position experts say may contribute to hip development issues. Reviewers say it's hard to beat the Ergobaby Four Position 360 for comfort, versatility and durability. Parents can wear their babies four different ways, including facing out and on their backs, and the wide, well-padded straps keep their backs and shoulders from feeling the strain. Babies are also kept comfy in ergonomically correct, hip-friendly positions. The carrier is machine washable and available in all cotton or cotton and mesh for warmer climates. The Baby Bjorn Original remains a longtime parent favorite because it's an unbeatable value and easy to use. No insert is required for newborns, who will find ample head support, and parents love being able to slip sleeping babies into and out of the carrier using the convenient side-latch design. The Original is machine-washable and able to last for years of use, parents say. It's available in cotton, soft jersey and mesh. Its unique double-loop design means the Baby K'tan is easier to master than most wrap carriers, which can require parents to wrestle long, unwieldly pieces of fabric. In contrast, the K'tan has a shorter learning curve, as well as more versatility than many carriers: There are at least five positions for baby, including facing out. This jersey cotton carrier can be machine washed and dried, and it's also available in mesh and tech fabric. The Maya Wrap Ring Sling has long been a pick for parents who prefer the unstructured ease of slings to fussier wraps and soft-structured carriers. Devotees say it's equally good for cuddling newborns or carrying small toddlers on the hip, and the long tail provides extra coverage for nursing mothers. The hand-loomed cotton is reportedly breathable and durable, and the sling can be tossed in the washer and dryer for easy cleaning. Baby carriers can be a lifesaver for busy parents. The right carrier enables mom or dad to hold baby close, while freeing up their hands to get something else done. Some even allow hands-free nursing. The best carrier for you is one that you and your child both feel comfortable with, is easy to use, and holds up over repeated use. Most baby carriers are well padded, adjustable and made with child-safe fabrics. Organic fabric choices are widely available. Always keep your receipt, as you may have to try a few carriers before finding one that fits you, your baby and your lifestyle. Baby carriers are just one part of a new parent's arsenal of baby gear. If you're searching for other baby products, check out our reports on baby monitors, baby gates, high chairs, portable cribs, baby swings, car seats and strollers. Soft-structured carriers give ample support provided by a combination of straps, buckles or clips. Many can be worn with the baby facing in or out. These carriers are padded and adjustable for different users, and most do a good job distributing the baby's weight evenly between the parent's shoulders and hips to ease potential back strain. They tend to be more intuitive than wraps and slings, and some are able to accommodate children from birth through toddlerhood, though they may require a separate infant insert. Whatever you choose, be sure it has the newer type of construction, with a wider panel for the baby's crotch to properly support the hips and affect healthy hip and spine development. Wraps support the baby with soft fabric that is draped across the parent's body. Unlike soft-structured carriers, they do not have built-in support. However, wraps can be more versatile, allowing a larger number of carrying positions. They are quite nursing-friendly and can be suitable for even the smallest newborns. They're also easy to ball up and carry, though they still may be too bulky for diaper bags. Ease of use is the biggest downfall with wraps – some are simply giant pieces of fabric that parents must learn to tie in a number of ways. Even after some practice, this can be inconvenient, especially in public. Like wraps, slings have no internal support. Some have a ring to thread fabric through that makes them more adjustable; others are simple pouches. Like wraps, slings are a favorite of nursing mothers because they make it easy to breastfeed discreetly. In general, slings are easier to use than wraps because they can be thrown on very quickly. These days, the most popular baby carriers are soft-structured carriers. Many parents are willing to pay a premium for them because they offer a hard-to-beat combination of ease of use, versatility, durability and comfort. For many, these carriers are even a convenient, hands-free alternative to strollers. The Ergobaby Four Position 360 (Est. 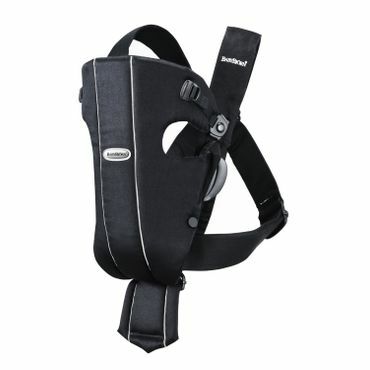 $160) is a favorite among parents because it keeps both wearer and baby comfortable, and allows a range of positions. It's suitable from 7 to 33 pounds, but up until 12 pounds parents must use the Easy Snug Infant Insert (Est. $25) with the carrier. As its name suggests, the Four Position 360 allows parents to carry their babies four different ways: Facing in, facing out, on the hip or on the back. Reviewers particularly appreciate that this carrier always keeps babies in a comfortable, ergonomically correct "frog leg" position. It's also comfortable for parents: Experts with BabyGearLab.com say the padded shoulder straps and wide waistband keep weight evenly distributed. Most parents agree, saying they don't feel much back or shoulder strain even after long periods. Reviewers give the Four Position 360 mixed reviews for ease of use. Most say it's quite easy to put on and the straps are easy to adjust, but some find the buttons that help reposition babies a bit fussy compared with snaps or buckles on other carriers. One feature reviewers particularly dislike is the Velcro waistband, which they say is loud and next to impossible to adjust once on. On the bright side, most report that it's easy to nurse in this carrier by simply loosening the straps a bit. The Ergobaby and infant insert are made of machine-washable cotton. The carrier has a hood but no storage pocket. One version is made with two breathable mesh panels for parents who live in warmer climates. A compatible Teething Pad (Est. $24) and Weather Cover (Est. $50) are among available accessories. Parents say Ergos last for years, and they expect this model to last, too. Parents who are OK trading the Ergobaby Four Position 360's versatility for longevity will want to look at the Tula Ergonomic (Est. $150). Every Tula is available in two sizes: baby, appropriate from 15 to 45 pounds, and toddler, for 25 to 50 pounds. The Tula Infant Insert (Est. $40) is available separately to make the baby-size Tula appropriate for newborns and babies smaller than 15 pounds. Babies and toddlers can use the Tula in two basic positions: front facing in, and back carry – they cannot face out or be carried on the hip. Like the Ergobaby, the Tula has a wider base that keeps babies' hips at a proper angle, and experts with BabyGearLab.com praise the roomy fit and padded leg holes for keeping tots comfy. They also give the Tula top marks for parent comfort, giving particular praise to the well-padded waistband and lack of pinch points. Parents agree, saying the Tula keeps the weight of even heavier kids well-distributed. The Tula also gets strong marks for ease of use. 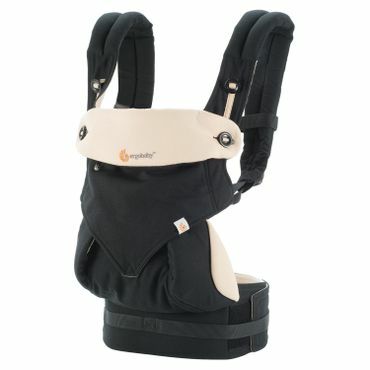 BabyGearLab.com's testers say it's more intuitive than similar carriers, with an easy-to-adjust waist buckle and shoulder straps. Parents say it's easy to nurse their babies in the Tula, which comes with a large, removable hood that can double as a nursing cover. The hood is also a favorite for keeping sleeping babies cozy. Hand-sewn from 100 percent cotton that's certified to be free of harmful substances, Tulas come in a huge array of colors and patterns. They are machine washable and come with a storage pouch on the waistband. Tulas have a strong reputation for durability, with some parents paying close to or more than full price for used Tulas, especially in a desirable print. If you don't want to spend more than $100 on a soft-structured carrier, you don't have to. One of the best-reviewed options that's easier on the budget is the Baby Bjorn Original (Est. $60). Suitable from 8 to 25 pounds, the Original doesn't have the longest lifespan, but it still draws lots of praise from parents because it's inexpensive and easy to use. No insert is required for small babies. The Original can be used facing in for smaller babies and facing out once babies reach about 4 to 6 months and can hold their heads up. Parents of newborns and small infants say their babies are very comfortable in the Original. However, they also say their child outgrows the carrier long before the 25-pound weight limit, and that carrying larger babies can cause neck and back strain. Heavier and taller parents also say this is not a good fit for them. Some parents say they are uncomfortable with the pressure the carrier puts on their baby's crotch – while research is mixed, some dedicated baby-wearers steer clear of this Bjorn because they say the seat isn't wide enough to provide optimal support for babies' hips. One of the most popular features of the Original baby carrier is the two-part, side-latch design that allows parents to remove babies without waking them; they also love how easy it is to put on and take off. It gets mixed reviews for being breastfeeding-friendly -- again, this seems to be easier with a smaller infant. The carrier is machine-washable and built to last, and many parents say it still looks like new after being used with multiple children. There are several fabric choices, including regular cotton, softer jersey and breathable mesh. Though they aren't as popular as soft-structured carriers, baby wraps and slings have a devoted following. Wraps are particularly popular for parents of newborns and small babies who want to keep their children as close as possible, while slings offer a little more breathing room and a shorter learning curve. The Baby K'tan (Est. 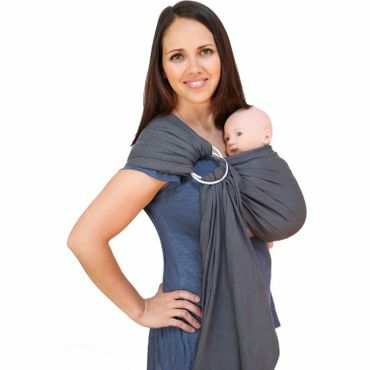 $50) wrap gets raves for eliminating the extra fabric and long learning curve common on other wrap-style carriers, while providing the same close, swaddled support. The K'tan's interlocking fabric loops allow several possible positions for soothing and carrying babies. While the K'tan is suitable from 8 to 35 pounds, most parents and reviewers say it is most useful and comfortable for smaller babies. According to parents, the Baby K'tan distributes weight more evenly than a sling, causing less back and shoulder strain. However, some still complain that it pulls on their shoulders, particularly as the baby grows and stretches the fabric. Many parents swear by this carrier for soothing colicky babies and relaxing babies with reflux enough to sleep in an upright position. The carrier offers at least five carrying positions, including forward-facing once the baby has complete head and neck control. The Baby K'tan is comprised of two jersey-knit loops and a separate sash that ties around the middle. Parents love that they don't have to wrap, knot or loop excess fabric and say the learning curve is shorter than with other wrap-style carriers. They also say it's easier to get the baby into and out of the carrier. That said, many note that you can't adjust the K'tan for tightness: You have to pick one of five sizes from the get-go, making it hard for parents to share. On the bright side, the K'tan is easy to machine wash and dry, and some say drying a stretched-out carrier can shrink it back to its original size. Some say the K'tan gets hot, particularly when used with the sash. K'tan makes two other versions of the carrier to address this concern: One has mesh, while the other has quick-dry polyester tech fabric. Buyers who would prefer a one-size-fits-all wrap have a strong candidate in the Boba Wrap (Est. $40). Like the Baby K'tan, it's suitable from birth up to 35 pounds and does not have buckles, snaps, straps or any other structure. However, while the K'tan is made of two loops and a sash, the Boba Wrap is made of one long, 5.5-yard length of fabric that should accommodate all wearers. Parents can stretch the Boba fabric quite wide over their shoulders while wrapping to better distribute their baby's weight. But as is the case for most wrap-style carriers, this works better with smaller babies, and some parents report aches and pains trying to carry older, heavier tots. Unlike the K'tan, the Boba Wrap doesn't allow babies to front-face. In fact, it only recommends two particular facing-in holds: one for newborns, and one for older babies. The Boba Wrap gets mixed reviews for ease of use: Parents like that the same size works for all wearers, unlike the K'tan. However, it also has a longer learning curve. Experts with BabyGearLab.com say they appreciate the detailed directions, but "it still takes some practice" to put it on quickly and confidently. Since the fabric is quite long, some reviewers note it can be awkward to put on when they're out and about. Once on, however, the Boba is quite comfy for babies and easy to nurse in, they say. The Boba Wrap is made of cotton and a touch of Spandex for stretch. It comes with a storage pouch and is available in at least eight colors, there's also an organic cotton option. Users can toss it in the washer and dryer, and reviewers say it's durable enough to last through multiple children. Parents who prefer an easier-to-use sling to wrap carriers rave about the Maya Wrap Ring Sling (Est. $80), suitable from birth to 35 pounds. Many users love the simplicity and versatility of the Maya for nursing and keeping their baby close. They also say the Maya makes a good pouch for babies and hip carrier for toddlers, but note that there is no back-carry position. Comprised of a wide, folded length of cloth, the Maya is worn over one shoulder and around the back. The folded fabric creates a pouch in front that holds the baby, and a double ring holds the cloth together. In order to distribute the baby's weight evenly across both shoulders, the fabric across the parent's back has to be adjusted correctly, which reviewers note takes practice. Some parents also struggle with pulling the outside fabric tight enough for a secure, hands-free hold. The adjustability of the Maya makes it a favorite for nursing at home and on the go. The pouch can be adjusted to support the baby's head while nursing, allowing mom to keep her hands free to help the baby or attend to other tasks. The Maya has a tail of loose fabric that hangs out of the tightened rings. Some find this extra fabric to be a nuisance, but many like to use it as a privacy shield for nursing or as a sun shield. The tail also has a pocket large enough to hold keys and a wallet or an extra diaper. The Maya comes in four different lengths, and parents say it can be worn comfortably by different sized parents by opting for a size in the middle. Made of breathable, hand-loomed cotton, it keeps babies close without overheating, many say. The sling reportedly stands up to the test of time without shrinking, stretching or discoloring, and it can be machine washed and dried. We found two sites that have performed recent comparative testing of baby carriers: BabyGearLab.com and TheNightlight.com. Both sites focus on soft-structured carriers and wraps. The book "Baby Bargains" by Denise and Alan Fields also offers extensive write-ups on baby carriers with picks made based on expert and parent feedback. Other helpful sites that incorporate both expert and parent opinions include BabyCenter.com, LuciesList.com, BabyList.com and Parents.com. As always, Amazon.com offers the most extensive and detailed collection of user reviews; other useful sites in this category are BabiesRUs.com and Target.com. Look for padded, breathable fabric.